Kilkenny retained their All-Ireland Hurling title as they beat Galway 3-22 to 3-11 in the final replay. Cyril Donnellan thought he had struck a third Galway goal but a free had been awarded and Kilkenny then took control. Donnellan was sent off for a wild pull and while Tony Og Regan's goal briefly gave Galway hope, Walter Walsh and Colin Fennelly hit further Cats goals. Galway substitute Johnny Glynn hammered in a goal with four minutes from time but it was scant consolation for the Tribesman who had shocked Kilkenny in the Leinster Final and then lost a seven-point lead in the drawn clash three weeks ago. The victory means that Henry Shefflin and Noel Hickey bring up their haul of All-Ireland Senior hurling medals to a record nine. Kilkenny manager Brian Cody's decision to give a championship debut to Walter Walsh at full-forward was totally vindicated as the youngster hit 1-3. 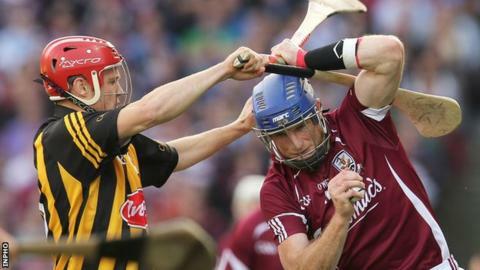 The Cats made the better start as Shefflin's four points helped them lead 0-4 to 0-2 but Galway seemed right back in the game when Burke rattled in two goals in two minutes to put them 2-2 to 0-5 to the good. But it proved a shortlived lead as Power notched Kilkenny's opening goal in the 19th minute after keeper James Skehill had only been able to parry an Eoin Larkin shot. With Galway failing to score a point from play in the opening period, the fired-up Cats took control and the Tribesman needed two Joe Canning frees to cut Kilkenny's advantage to four (1-11 to 2-4) at the interval. Galway threatened to get back into the contest after the break and Donnellan was decidedly unlucky to see his goal cancelled out after a free had already been awarded to the Tribesmen. A point accrued from the free but the Galway players protested that the advantage should have been played. Another bad break for Galway saw Canning's goalbound shot hitting the foot of an upright and Kilkenny immediately worked the ball downfield with Cillian Buckley notching a point. Galway frustration was emphasised as Donnellan received his straight red card in the 49th minute for a wild and late pull on JJ Delaney. Donnellan's sending-off was followed by four unanswered Cats points as the holders stretched their lead to 1-18 to 1-8. Regan's goal on 56 minutes cut Kilkenny's lead to seven but the Cats rattled in their second goal two minutes later as Walter netted from closer range after sub keeper Fergal Flannery had failed to hold TJ Reid's shot. Colin Fennelly, the man replaced by Walsh, was introduced with 10 minutes left and struck Kilkenny's third goal within two minutes. Youngster Glynn hammered in a late Galway goal but it was Kilkenny's day as they won the county's 34th All-Ireland title and sixth Liam McCarthy Cup in seven seasons.